The course is for beginners who are interested in the Japanese language and culture. Communicative language activities are provided and used within the context of Japanese settings, such as traveling, shopping etc. You will be able to speak simple Japanese right away. Reading and writing of Japanese characters will not be taken in the course. 1. Understand and use familiar everyday expressions and very basic phrases aimed at the satisfaction of needs of a concrete type, such as how to order food and drinks. 2. Introduce oneself and others, and can ask and answer questions about personal details such as one’s family and where one lives. 3. Interact in a simple way provided the other person talks slowly and clearly, and is prepared to help. The Japan Foundation, Manila offers “Interactive Lecture & Exercises” from N5 to N3 levels. Prepare yourself for the upcoming JLPT (Sunday – December 3, 2017)! The Japanese Language Proficiency Test (JLPT), which was modified in 2010, measures communicative competence required to perform various tasks. The JLPT tests not only a learner’s knowledge of vocabulary and grammar, but also his/her Japanese comprehension at using the knowledge in practical communication. This lecture is for those who have not yet taken the JLPT, or for those who have taken a certain level, but would like to know the contents of a different level that they plan to take. Participants will be introduced to the types of questions which will appear in each test section to familiarize them with the nature of the JLPT. This is open to those who plan to take level N5, N4, or N3. *Applicants will be accepted on a FIRST-COME, FIRST-SERVED basis. Please submit the duly accomplished application form with the payment to the Japan Foundation, Manila on or before the deadline indicated in the table above. The Examinee’s Registration Number and the PASSWORD (8-digit number) are required to be able to access the test result online. Should an examinee fail to view the test result online – The Japan Foundation, Manila (JFM) is to disseminate (to the indicated mailing address) the score report / certificate (printed / hard copy) by October 2017. In Module 2 (of a three-module series), learners will be able to deal with a wide range of situations while taking sociolinguistic appropriateness, etc. into account. Can-do objectives include showing a visitor around one’s house, introducing one’s family members, talking about recent news about one’s friends, giving opinions and correlated reasons, etc. with reference to topics like learning a foreign language, marriage, and so on, and at the same time reviewing previously learned expressions. Submit duly accomplished application form to the JFM together with the payment on or before Sept. 8, 2017 (Tuesday). For those who have NOT taken the Marugoto Pre-Intermediate A2/B1 Module 1, please e-mail your application form and preferred schedule to nihongo1@jfmo.org.ph by Sept. 8 (Friday). Available schedule: Sept. 12 (Tuesday) & Sept. 13 (Wednesday) from 2:00p.m. – 5:00p.m. Are you looking for a chance to practice your Nihongo? Why not join the Oshaberi Salon? 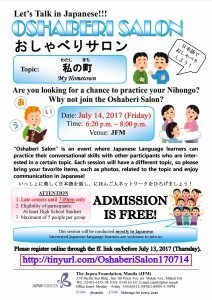 “Oshaberi Salon” is an event where Japanese Language learners can practice their conversational skills with other participants who are interested in a certain topic. Each session will have a different topic, so please bring your favorite items, such as photos which are related to the topic and enjoy communication in Japanese! Registration Please register online through the link below. This session will be conducted mostly in Japanese. Interested Japanese-language learners are welcome to join us. In 2017, JLPT will be offered in the Philippines on July 2 and December 3 at three test sites: Manila, Cebu and Davao. Please be advised that the application procedure has been changed. For the Dec. 3 JLPT the online application covers Manila, Cebu and Davao. APPLICANTS MUST REGISTER ONLINE from July 25, 2017 to August 29, 2017. Please see further information at the JLPT page. “Sensei no Wa” is open to both experienced and neophyte Japanese-language teachers, and offers a platform for information exchange with one’s peers. It is for the further encouragement of Japanese Language Education and aims to support professional enrichment and network expansion through interactive learning. Mae Coloma was fortunate enough to be a recipient of the Short Term Teacher’s Training Program at the Japan Foundation Language Institute in Urawa in the summer of 2016. Though it was her second time in Urawa, there was never a lack of insights and revelations into teaching Japanese as a Second Language. The Internet World is a wonderful place to learn Japanese. In this Sensei no Wa session, Ms. Coloma will convey ideas on how to engage students in internet tasks and share some useful sites that a teacher can use in preparing for his/her lesson. Come and join the workshop, share and learn from one another on how to engage our tech-savvy students in learning Japanese. Time 6:30 p.m. – 8:00 p.m. Interested parties, please fill out the online application form (http://tinyurl.com/SenseinoWa20170811) on or before August 10, 2017 (Thursday), 5PM. Submission of application forms will be disabled after the deadline. The Japan Foundation, Manila offers “Interactive Lecture & Exercises” from N5 to N3 levels. Prepare yourself for the upcoming JLPT (Sunday – July 2, 2017)! ** All sessions of the same level will have the same syllabus. Interested applicants may choose only one (1) session which is most suitable to their personal schedule.